It is with our great pleasure to introduce the South Bay’s seafood, steak & spirits institution since 2000, ROCK'N FISH, to the Downtown L.A. LIVE campus. ROCK'N FISH features an array of savory dishes influenced by the flavors of New Orleans and Asia. Originally built on the site of the legendary Hibachi Restaurant, ROCK'N FISH carries on the tradition with some of Hibachi’s signature dishes and cocktails at both its Manhattan Beach and new L.A. LIVE locations. Beloved favorites, such as the Navy Grog, Teriyaki Chicken, Sticky Rice, and Hibachi Dressing, have been remembered in our Steak and Seafood Menu. We only use the highest quality meats and freshest fish, which are brought in daily for your pleasure. Enjoy one of our house specialties such as the Oak Grilled Artichoke, Blue Cheese Wedge Salad, BBQ Shrimp, or Kapalua Rib-eye. • The Mezzanine - a dining area overlooking the main dining area and bar, which comfortably seats up to 40 guests. 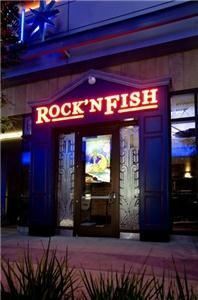 It's a great place to host a private party, without giving up the lively atmosphere of ROCK'N FISH. • The Patio - an enclosed area located in the front of the restaurant, which comfortably seats up to 50 guests.